Out this week we have five DVDs to feature: Sanctuary: The Complete First Season, Doctor Who: The Next Doctor, The Big Bang Theory: The Complete Second Season, Star Wars: The Clone Wars - Clone Commandos , Primeval, Vol. 2 (Series 3) , X-Men Origins: Wolverine. Doctor Who: The Next Doctor (2008 Christmas Special) : Victorian London is the setting of this "Doctor Who" Christmas special, which finds the time-traveling doc (David Tennant) arriving in the city on Christmas Eve, 1851, to investigate a string of murders -- only to encounter a familiar foe: the Cybermen. He also crosses paths with another Doctor (David Morrissey) -- whom he believes is a regeneration of himself -- and together they must battle their common enemy, the evil Mercy Hartigan. The Big Bang Theory: The Complete Second Season : This show is great geeky fun that is also a celebration in fandom. Whenever I want a nice laugh that still stimulates my mind with random science and a verbose vocabulary Big Bang Theory is my pick. I see a lot of myself in Leonard and I do live with Sheldon. 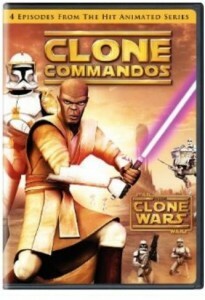 Star Wars: The Clone Wars - Clone Commandos : The second pack release of the TV Star Wars Series: Clone Wars. This DVD has four really good episodes "Rookies," "Storm Over Ryloth," "Innocents of Ryloth" and "Liberty on Ryloth." Full of Mace Windu goodness a plus yet not the complete series. I already own the complete series through . For those wanting to get it on DVD I would wait for the complete season which has a rumored fall release, fingers crossed. Primeval, Vol. 2 (Series 3) : Is this series any good? I have watched some of the trailers for it but they did not get me excited to want to watch it. Evolutionary zoologist Nick Cutter recruits Egyptologist Sarah Page to the team, hoping her research can shed some light on the mysterious time anomalies that continue to deposit dangerous dinosaurs in modern England.